The experience our legal assistants receive goes well beyond the experience legal assistants typically get at other law firms. 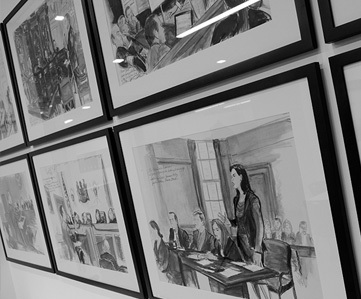 You will not only work on cases, you will also be part of ‎a team developing and implementing the strategy to address the challenges of our clients who are involved in some of the most interesting litigation going on in the United States today. You will also see how a growing, entrepreneurial organization operates and learn about the business as well as the practice of law. We may ask you to run down the street to Staples to pick up some exhibit stickers as we prepare for trial, or we may ask you to jump on a plane to assist with interviews of witnesses in Asia or the Middle East. You may be at a pitch where we are competing to be retained on a case worth billions of dollars to the client, or you may be cite-checking a brief to be filed in the Supreme Court of the United States. Our legal assistants have seen and done it all. Typically, legal assistants join us right out of college or shortly thereafter. They usually stay for two years, sometimes one year. Many have gone on to law school. We are proud to have ML alums at places like Harvard, Michigan, Columbia, Stanford, Yale, and other top schools. A few have pursued opportunities in tech, communications, finance, and other industries – building on the business experience they gained with us. We look for bright, hard-working individuals with a strong interest in the type of work we do, who are good communicators and team oriented. ‎We usually receive resumes from people in their senior year of college who are looking to start with us after graduation, but we also interview and hire throughout the year, depending on our needs. If you think you are a good fit for our team, please email us, explaining your interest and including your resume, to prostaff@mololamken.com.